Call me a day late and a dollar short if you need to but there just wasn’t time to post this Sunday and be reasonably sure I was satisfied with the end product. I also wanted to try and catch all the typos and 1AM is not the time to be looking for typos so with apologies to all, I wanted to write about those mothers we don’t always think about, the ones who take on a part of raising us when we are away from the direct influence of our own parents. I’ve written a good deal about both of my grandmothers and the impact they had on me and all I owe to them…and then there is my own mom, the only one I have and to whom I owe the most out of all the mothers I was blessed with. I’ve also written about her and the impact she continues to have on me today. These are the mothers we are fortunate to receive by birth but if we are lucky, we sometimes pick up a few others by chance and I’ve known a few of them in my lifetime and I have benefitted from those relationships a great deal. Some of them were “honorary” mothers, those who, for whatever reason, never had children but instead chose their own and mothered them with the same instinct, dedication and care of a professional parent. Others were the mothers of my closest friends who, through frequent contact, became like second mothers to me because their actions consistently demonstrated that they cared about me. As children, we respond to people like these and we forge a bond with both kinds that can last a lifetime. This article is about two of them. Those that know me personally will know who they are; to those readers that don’t, let me assure you that both of them were and are real people who I owe a lot to for the care they gave and still give to me and those I care the most about. One type is what I call a “Mother by Choice”. They might be neighbors, teachers and Sunday school teachers, friends of your parents or just someone you meet one day in the right place and at the right time and somehow, a relationship begins to form. In 1973, my parents built a new house and moved into the neighborhood that I would spend a significant part of my life growing up in. An older couple (they were in their fifties you know) lived in the house next door and they had no children of their own. The day we moved in, they came over and welcomed my much younger parents and my brother and I to our new home. Being a social type at the age of seven, I felt obligated to reciprocate and began to pay frequent visits to their home as well, walking through our front yard into theirs, which adjoined ours on the same street. If they never had any experience dealing with children, it didn’t show in their actions because I was always welcome at their house where I was frequently scolded for having gotten too hot from playing, offered large glasses of ice water and always told to come back and see them. They had air conditioning but rarely ever used it because their lot had so many trees that the house was constantly shaded during the summer. During the day, they only closed the screen door and I rarely ever got past the threshold of the carport before she would call out to me to come on in the house. I later learned that from her chair, she could see through the screen door all the way over to my front yard and usually knew when I was coming. A couple of years after we moved in, she and her husband decided to plant a line of shrubbery from the street to the backyard, along our mutual property line. The tall, narrow red tips were spaced evenly, so many feet apart and they grew quickly forming a hedge that I’m sure helped cut down the sounds of the noisy children playing in our front yard. At first I was distressed because my access to their house was seemingly cut off (short of detouring into the street) but when the plantings were done, I discovered that she and her husband had made a mistake in their measurements. Each one of them were planted precisely the same number of feet apart until you got about halfway down the row, where the obvious mistake had been made. There, the distance between two of them had been gapped about two feet more than it should have been, leaving an obvious hole in the hedge and from there, it continued on correctly to the end of the row. Thinking myself fortunate, I began to use this access through the hedge to pay visits to them and was, as always, welcomed into their home. A year later, her husband passed away rather suddenly and knowing she was now alone, I would go and visit more often. One of her favorite dishes was homemade oyster stew and it just happened to be one of mine as well. Oftentimes she would call on the phone and tell me she had made too much (this seemed to happen every time she made it) and to come over and eat with her. I would head through the hole in the hedge and over to her house where a hot bowl of oyster stew, complete with the necessary oyster crackers, waited on the table and we would eat and visit. She remarried a couple of years later and made it a point to introduce me to her future husband and even asked me if it was ok that she got married again. I agreed to the marriage and got along well with her new husband in the years that followed. During the time I lived there, she was always supportive and understanding and when she sent Christmas cards each year to my parents, she always sent me a separate one with a nice note in it, several of which I still have today. When I was an adult and she was sick with cancer, I went to visit her and we had our last time together. I had parked at my mother’s house and walked over through the hole to her house for the last time. While I was there, the subject of the hedge came up and I told her how grateful I was that she and her first husband had made the mistake in the hedge and that I had been able to use it for so many years to come over. She just smiled at me and said “Honey, we made that hole there for you”. I’ve never forgotten what a wonderful mother she grew to become and how much I enjoyed spending time with her. You can also gain mothers by the people you associate with or “Mothers by Association”. If you have friends when you are growing up and they have mothers, you are going to find yourself within their maternal sphere of influence quite often. Once they’ve determined that you don’t pose a threat to their child and come from what qualifies as a normal family here in the South, they’ll open the door a bit and let you through that outer circle and into the middle one. As time goes by and close friendships form such as the one I had with my best friend, they let you pass through to that inner circle, the one where you become like extended family to them and what happens to them matters a great deal to you. A place is always available at their dinner table should you happen by; they are willing to forgive even your most serious transgressions, they won’t hesitate to bless you out when you need it and they delight in your accomplishments almost as much as they do those of their own children. My best friend’s mom was like this with me and to this day, she will still fuss at me if she thinks I need it and most of the time I probably do. Like her own children, I would never be able to pull the wool over her eyes and she would always know if something was wrong no matter how good a game face I might have. She and her husband both worked but she always came home and managed to put together a wonderful meal for her family and the occasional neighbor’s kid who lingered around hoping for mashed potatoes, dinner rolls and the only meatloaf I ever thought enough of to get the recipe for my own mother to make. My best friend’s life ended unexpectedly over a decade ago and we all feel that loss deeply but it didn’t change the bond I had with her except to strengthen it because the people who are important to those you care about become just as important to you as well. The role he would have had in my son’s life, as his Godfather, was taken up by his younger brother, who I was equally close to and when that happened, his parents made it clear that they were his God-grandparents because of this. When he was in his age-three kindergarten, they had grandmother’s day at his school and my mother was on a trip out of town and couldn’t be there for it. His God-grandmother stepped right up to the plate and went in her place and they had a wonderful time. 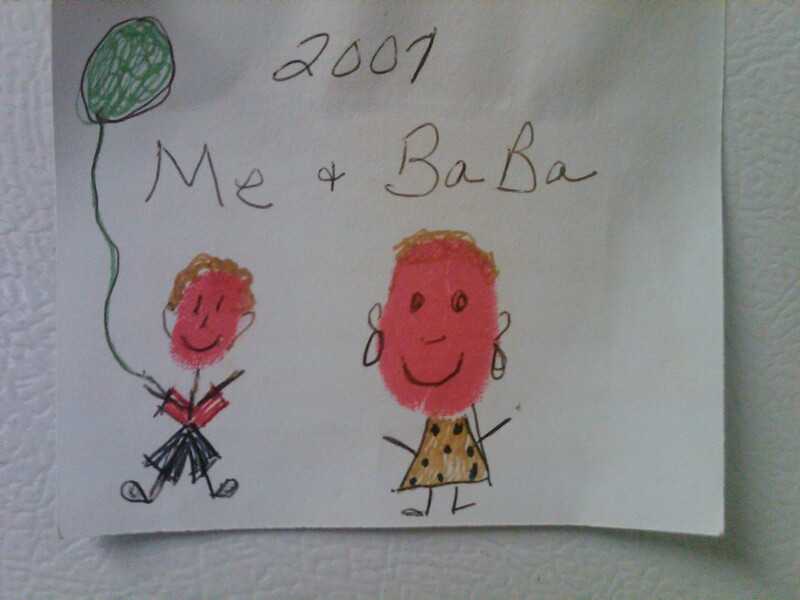 A small picture magnet they made together out of their thumbprints to resemble the two of them has graced our refrigerator ever since, with the title “Me and Baba” written above it, a testimony to a bond he shares with her as well as with her husband who has also been like a second Dad to me. People who can love their own children to the limits of what is possible and who still have the capacity to love the children of others are unique and treasured people and must never be taken for granted because they are truly a gift from God. I see that trait in my wife already and marvel at her capacity for loving other’s children the way she does and yet still be the wonderful mother she is to our son. Mothers provide so much of what is needed for a child to grow and develop while feeling safe and loved and cared for but like Santa Claus, they need a lot of “helpers” to get their job done. My mother no doubt needed that as well and I am grateful to have been blessed with several of them, not just the two I chose to write about but all of them who make up a part of my life and who are now a part of my family’s life as well. To all the mothers out there, no matter what makes you a mother, I say Happy Mother’s Day to you all. You deserve it.